Peter Houston knows what it takes to win the Scottish Cup. That will always be the defining moment of his career, leading Dundee United to a sun-drenched afternoon of triumph at Hampden Park in May 2010, and it continues to be relevant to his work. The circumstances are different for Falkirk, but as Houston prepares his side for the semi-final against Hibernian on Saturday he is drawing on his past experience. Some of it is merely comforting - he is taking the team to the same hotel that United stayed in the night before their semi-final against Raith Rovers five years ago - but mostly it is significant. Houston's influence will be most critical in the days and hours leading up to the game. "I approached the [final] against Ross County by naming my team on the Thursday, which I've [done] again, because the two days [before the final] are specific on players' roles and set-pieces," Houston said. "They're very important days. The experience I've had has stood me in good stead for how planning the week, but also stupid things. If we're lucky enough to reach the final then I'll try to take them to the same hotel that I took United to ahead of the final, which was different [from the semi-final]. "My experience of that preparation is helping me and hopefully it will help the team because my biggest job prior to the game is making sure that they're settled and confident in their own ability. They've got us to the semi-final. We have to make sure that we believe in ourselves rather than worry about what Hibs can do to us." Houston is working with a small squad that is a combination of young, developing talents and players like David McCracken and Jamie Macdonald who have years of experience between them. Hibs, in size and stature, are a bigger club, yet Falkirk have two 1-0 wins and a 3-3 draw from their league meetings this season. Falkirk generally play attractive, composed football, although they can lack a cutting edge. There ought to be no sense of inferiority as they prepare for the semi-final, although the historical order of Scottish football would place Hibs above Falkirk. That alone is motivation to Houston. He has held an affection for Falkirk since a popular spell at the club as a player, and the opportunity to return to the club as manager was enough to tempt him away from a role as senior European scout for Celtic. His status with the fans has not always protected him, though. "I remember getting into my car after a victory over Alloa early in the season and the first phone call into [Off The Ball] was: 'get Houston out'. We'd just won!" he laughs. "You say to yourself, I want to prove these people wrong." Personal criticism is an inevitable aspect of the job, but Houston has worked in the game for long enough to understand how exposed a manager can be. His career is testament to his coaching ability, but also his ability to develop. He worked ostensibly as a coach and an assistant manager - most successfully with his friend Craig Levein - but then Levein was offered the Scotland job and Houston was placed in temporary charge of Dundee United. He found the transition awkward, and a 7-1 defeat at Ibrox seemed to confirm his self-doubt. It took the cup final victory, months later and when he was still only in interim charge, for Houston to be established as a manager in his own right. Houston's development mirrored the progress of the United team, which he had helped to assemble with Levein but which came of age under his guidance. "When I took over I didn't really think it was for me, we had a couple of results that weren't very good, losing 7-1 at Ibrox when I thought, 'nah, stuff this'," he says. "So I let the club go and have a look at other people and I got the team settled. But I got myself settled as well and grew into it. We went on a run in the league that took us to third, eight points ahead of Hibs in fourth. We went to Ibrox in the Scottish Cup, we were 3-1 down with 10 minutes to go, got it back to 3-3 and won the replay. "The players stood up to be counted, they grew in confidence and I grew in confidence as well with regards to shaping up the team, because I'd worked as a number two, and even as a number three or four at Hearts when Jim [Jefferies] and Billy [Brown] were there. "Winning [the Scottish Cup] clinched it with regards to the board of directors, but I enjoyed being my own guy. You rise and fall by your own decisions. As an assistant manager, you always had discussions with the manager but you also always backed his decision. I learned that, you go with him 100% and if his choice doesn't happen you don't try to make out, 'I told you so'. As the manager you have these decisions to make." Key choices have presented themselves already. Rory Loy is Falkirk's top scorer, with 12 goals, and achieved the same accolade last season. 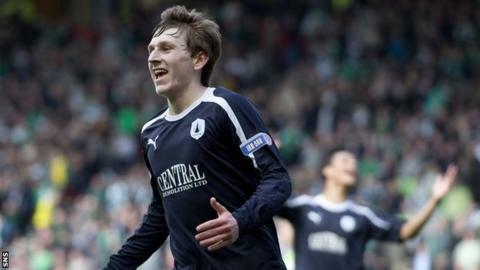 He bruised a bone in the Scottish Cup quarter-final victory over Queen of the South and has not played since - a run of eight games in which Falkirk have won only four times. Loy is the team's best striker and plays a pivotal role in the team's shape, but Houston will not risk him if he is not 100% fit. "The big pitch, the massive occasion at Hampden, I can understand him wanting to be involved but we're better with 11 fit guys," Houston says. "I need somebody on a big pitch like that who can get around the park." Video analysis has been carried out, a game strategy has been devised and plans are in place to cope with the threat that Hibs carry at set-pieces. Houston and his backroom staff have provided as much information as they can to the players, to enable them to deliver the best performance they can on the day. Two of them - Craig Sibbald and Blair Alston - were in the Falkirk side that surrendered a 3-0 half-time lead to Hibs in the 2013 Scottish Cup semi-final. Houston has not spoken to either of them individually about that experience, but is confident the current side is better quipped, mentally and physically, to handle the occasion however it unfolds. The final message to them from Houston is that, if they believe in themselves, they can play their way into the club's history books, the same way that he did at United. "Players can make themselves legends at a club if they get to a final and win it," he says. "I'll try to use that as motivation. "It was 1957 when Falkirk last won the cup and there are photos of that team all over the place. In years to come, it could be their photographs. If we play as well as we can, and defend as well as we can, we see this as a wonderful opportunity to get to the final. "This was the draw that both clubs probably wanted, bring it on. Let the battle commence."